This letter was originally published in Trafic 45 (Spring 2003). Towards the end of 2002, a new poster campaign began to appear throughout the city. 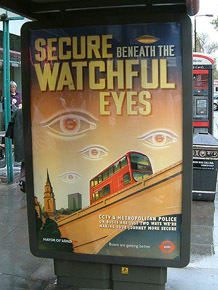 “Secure beneath the watchful eyes” was the slogan emblazoned above a design depicting huge, flying saucer-like eyes hovering in the London sky. It was the deliberately archaic quality of the poster’s design that struck me first. A clever graphic artist had obviously drawn on two key stylistic references: classic science-fiction of the 1930s and 1940s (of The War of the Worlds genre) and World War Two ‘Home Front’ propaganda (of the Walls Have Ears variety). There are certainly plenty of “watchful (mechanical) eyes” in London and throughout the UK. In fact, there is a greater density of CCTV (Closed Circuit Television) surveillance in the UK than in any other country in Western Europe (1). But can it really be claimed that, in London or anywhere else in the UK, we truly feel more ‘secure’ under such eyes? Security isn’t the only issue here, merely a mechanical reassurance. The overwhelming level of surveillance in the UK has a deeper resonance and graver consequences that are worth examining. What did this poster communicate beyond its purpose of reassuring people travelling on London buses that, with the increase in CCTV surveillance, they’d be safer and even more ‘secure’ than before? Firstly, it said that ‘the future’ is already dated, old-fashioned, something to be depicted through kitsch design. And secondly, it implied that we are already in a state of war. It seems that I wasn’t alone in having ambiguous and conflicting reactions. Researching the poster campaign I discovered a number of internet web-logs detailing other people’s outraged responses. As one web-log commentator noted of the poster: “It’s like something out of a Fritz Lang movie” (2). Fear, paranoia, security and surveillance: the legacy of Dr. Mabuse is certainly rich in the city I write from. During the week in which I was completing this letter, two events occurred in London which reassured me that not only is it possible to consider examples of film, art and moving-images from the perspective of surveillance, but that it is imperative to do so. The first of these events involved the arrest (and subsequent speedy release) of three North African men suspected of planning to detonate a poison-gas bomb in the London Underground. In the post-September 11th climate and in preparation for what appears to be an inevitable American-led strike on Iraq, this episode fed into a climate of fear and paranoia that can only be described as a state of “Phoney War”. And when the repeated refrain among many Western European Police and Intelligence communities states that it’s not so much a question of if but rather when such an attack takes place, then it’s clear how the liaison between ‘surveillance’ and ‘security’ comes into play with ever greater intensity. The second event concerns the controversial scheme introduced by the Mayor of London to make drivers in Inner London pay a ‘Congestion Charge’ fee. Designed to reduce the amount of traffic on London’s already over-congested roads and to persuade more people onto public transport (where, no doubt, they’ll feel ‘secure under the watchful eyes’), this scheme will be facilitated by the use of a CCTV surveillance system capable of reading 90% of car registration plates. In the name of environmental concerns, and at a moment of no little fear, London has become the panopticon-city that would make that 18th century British reformer Jeremy Bentham proud. So how does one approach a diversity of works, made for cinema, television and the gallery, in light of this? The condition of being a subject of surveillance is clearly omnipresent and television has happily hooked itself into what might be called the ‘panoptical imaginary’. Consider the extraordinary success and popularity of ‘Reality TV’ shows such as Big Brother (the British equivalent of Loft Story), for whose first series more people voted than did in recent elections in the UK (to which fact nothing, and everything, need be added). Surveillance is a given condition of debates about law, order and social control. All of which is only to state the obvious, to invoke a national variation on a global theme. So much so, in fact, that between October 2001 and February 2002 the Zentrum fur Kust und Media (ZKM) in Karslruhe, Germany devoted a major exhibition to the subject: CTRL Space: Rhetorics of Surveillance from Bentham to Big Brother. The catalogue that accompanied the show has been an invaluable companion in researching this letter and must surely stand as a key work of reference on the subject if one begins to approach surveillance not only as a means of externally-imposed social control but also as an increasingly internalised condition. From which it’s only a short step to asking: what are the conditions of this internalised self-surveillance? What are its aesthetics and its rhetorics as visible in the UK? One place to start from is the assertion made by Ursula Frohne in her essay for the exhibition catalogue: “The unforeseen success of docu-soaps such as Big Brother indicates that we are on the threshold of a transition from the bureaucratic-institutional tactics of surveillance to the medially-staged spectacle of the individual’s total surrender to the media’s regime of the gaze.” (3) Cinema, and other moving-image art forms, occupy a privileged position in this transition, existing between the bureaucratic-institutional and the medially-staged spectacle and are able to recruit, represent and possibly even détourne the apparatus by which internalisation takes place. In so doing, certain works provide valuable meditations on the aesthetics and rhetorics of the condition of internalised surveillance. For example, consider the success of Kiarostami’s Ten when it was shown in London. Rapturous reviews, sell-out houses, but a strange sense of irony underpinned the welcome given to the film. For Western metropolitan liberals to watch Ten – which for most British reviewers was a film about ‘the condition of women in post-revolutionary Iran’ – is inevitably a self-affirming experience. But what the reviewers missed, or decided not to dwell on, was the insistently surveillance-like nature of the film’s dispositif. It’s not entirely cynical to suggest that such denial might itself be a symptom of the overwhelming levels of surveillance in the UK, but it’s also of a part with the sense of reassurance that Western liberals derive from the spectacle of ‘the Iranian woman’, that of a highly desirable ‘other’ (‘desirable’ for all sorts of self-affirming reasons, it should be said). If the pleasure to be derived from Ten rests partly in the spectacle of Iranian women negotiating and living beyond the power that a theocratic state exercises over them, that power is perversely even more present by its absence. The world beyond the front seats of the car driven through the streets of Tehran cannot help but be insistently present – in the passenger seat and through the car windows, as well as in the way that the microcosmic environment of the film’s setting inevitably gives onto the macrocosm of the wider society. The success of Ten for its London audiences illustrates that, to a certain extent, there is ‘bad’ (or, at least, ‘unacceptable’) surveillance – that of a theocratic state over women – and ‘better’ (or, at least, more ‘acceptable’) surveillance – that of our own state over us. But that a conjunction between the two might be considered possible was nowhere evident in criticism of the film. It was a conjunction made impossible, or at least disabled, by the terms of the ‘otherness’ attributed to the film by lazy reviewers: an Iranian auteur making a digital-video feature about the state of women in Iran. But it is a conjunction made explicit by Kiarostami’s own technical-aesthetic procedure in Ten, in which the auteur ‘vanishes’ while remaining strongly present. Kiarostami poses a very simple and direct question (one he posed earlier, in different terms, in Close Up): ‘Who’s behind the camera?’ And he then proceeds to complicate the answer to this question by insisting that it’s not him. That, as the auteur, he’s been “eliminated”. Why is Kiarostami’s double-edged self-elimination so useful in understanding the rhetorics and aesthetics of internalised surveillance? Because, in Ten, it involves his playing a finely-balanced game of hide-and-seek, of visibility and invisibility, of presence and absence (and all in the space of a car!). Surveillance, understood here as a rhetoric of video, allows him to extend this game to an extraordinary degree. Thanks to the digital video-camera Kiarostami, already a master of the plan fixe, can absent himself from his habitual position behind the camera to occupy another, equally decisive off-screen space. As he admitted to Cahiers du cinéma, he was sitting in the back seat of the car whispering (like Godard to Marina Vlady on Deux ou trios choses que je sais d’elle) via a microphone into Mania Akbari’s ear. And, as Patrice Blouin observed in his review of the film “that which the director calls ‘the disappearance of the mise-en-scène’ is nothing other than its faithful continuation by other means.” Blouin also observes that Kiarostami uses the digital video cameras installed in the car “not in order to subjugate his performers, to examine them like lab-rats or intruders in the garden but just the reverse, to leave them greater freedom – even to give them a new, unexpected margin (une marge inédite).” In conclusion, Blouin states that “With ‘Ten’ he invents, all in one go, ‘affective video-surveillance’. It’s our new name for cinema.” (4) Aside from the fact that, with these observations, Blouin opens up an approach to Ten that not a single British critic appears to have noticed, there is also this interesting and potentially productive figure of ‘la marge inédite’. Might it be that, in Ten, this ‘new margin’ is the margin of invisibility within the visible, the possibility of disappearing within full view of the crowd of eyes? Why not? After all, consider how Kiarostami condenses this play between the ‘visible’ and ‘invisible’ (the socially-permitted image and the taboo image) into a single ‘shocking’ image, that of the female passenger who raises her headscarf to reveal her shaven head. No infringement of Islamic law here, which, in Iran, dictates that a woman’s hair must be covered. In the absence of hair the lifting of the headscarf is, it appears, permissible. It is a characteristically vertiginous moment of self-reflexivity for a Kiarostami film and one in which a surveillance-like aesthetic system delivers an extraordinary revelation of the invisible at the heart of the visible. From Kiarostami’s Ten to Chris Petit and Iain Sinclair’s essay-film London Orbital is not such a great leap. The two films share many of the same elements, it’s just a different city, a different road, a different car endlessly circulating and a slightly different but allied deployment of surveillance aesthetics that one discovers in London Orbital. I am aware that this duo of British writer-filmmakers probably requires a short introduction (5). Sinclair, a poet, novelist, essayist, former film-student and bookseller has invented, described and inhabited his own convincing psycho-geography of the city. Drawing on William Blake and J.G. Ballard alike, Sinclair transfigures the trash, absorbs the deep pulse of History and pours it all out in vivid, energetic and generous prose. It was a collection of his essay-excursions throughout London, Lights Out for the Territory , that delivered a surprise bestseller. In Paris, one is guided par arrondissement (courtesy of the wonderfully named Editions de l’Indispensable); in London, we use the A to Z or the Nicholson’s Street Finder. Sinclair reorders these established cartographies, cutting new and unfamiliar shapes into the surface of the official map. His most recent collection of essays London Orbital: A Walk around the M25 , reminds readers that London is a monstrous conurbation fed for decades by suburban-dwelling white-collar workers. For anyone deciding to immerse them self in the city both are necessary books. Not only will they tell you more than you could ever want or need to know, they have a splendid distemper about them, a justifiable anger towards the spectacle of the decay of the city in which the author has lived for over 30 years. Petit is a novelist, a former film-critic and director (6). Backed by Channel Four, the last three films they have made together have reinvented the ‘artisanal’ mode of personal filmmaking. Sinclair, having been trained as a filmmaker in his youth, followed the example of his favourite auteur, Stan Brakhage, and turned to an intimate, diaristic form of Super-8mm ‘chamber cinema’ in the 1960s and 1970s. Thirty years later and it’s only the technology that’s changed. Petit, bored with the cumbersome slowness of feature film production and frustrated by the increasingly bureaucratic nature of television commissioning, took to tape and then to digital like a born-again avant-garde diarist (7). The films they have produced together are meshed webs of photography, Super-8mm film and digital video. They are ‘essay-films’ that look to the example of Chris Marker’s travelogues and, as Serafino Murri has observed “It is as if the spirit of Marker’s ‘Sans Soleil’ and ‘La Jetée’ were reincarnated with more advanced technology, the same technology of music videos and advertisements – in an eclectic mix of formats, techniques and filming solutions – to return to discussing, with poetry and disenchantment, the world’s truth transformed into images of itself.” (8) In London Orbital, this approach is applied, with great effectiveness, to the generic landscape of London and its huge peripheral motorway (the M25), a landscape of urban shopping malls, parking lots and post-modernist architecture. These are the ‘non-places’ of hyper-modernity, as Marc Augé has christened them, whose privileged aesthetic, whose own ‘cinema’ one might say, is supplied by the constant monitoring of the CCTV camera (9). The ‘Ballardian poetic’, then, is a valuable resource for imaginative filmmakers and writers working in the UK in its present state (one in which ‘the future’ has arrived and taken up uncertain, discomforting residence). It allows the transfiguration of an increasingly culturally homogenised, panic-stricken and media-saturated landscape into one of myths and wonders. In these terms, the contestants on Big Brother could be seen as no longer being the media-processed cretins that the press loves to hate, but CCTV cosmonauts who have stepped through Ballard’s ‘doorway’ to explore the “total alienation” that lies beyond. And a Ballardian cinema is beginning to emerge, if only in the form of screen adaptations of his novels such as Steven Spielberg’s version of Empire of the Sun, David Cronenberg’s Crash, Jonathan Weiss’s The Atrocity Exhibition, Solveig Nordlund’s Low Flying Aircraft and John Maybury’s forthcoming version of Super Cannes. Petit and Sinclair have never done anything so vulgar as attempting to ‘adapt’ a Ballard fiction. They understand too well that we now live in the landscape that Ballard has been faithfully anatomising and populating with characters since the 1960s. Why bother ‘adapting’ when you can hit the motorway and find all the sets, the actors and the (CCTV) camera positions ready and waiting for you? It should be said that, while it was commissioned by Channel Four television, London Orbital is an anomalous work in the current context of British television: in the demands it makes on its viewers, its experimental form, its unapologetic use of durational structures (road-time, surveillance-time, boredom as transcendence). It’s closer in many respects to the sort of moving-image work displayed in the more fertile and ‘open’ domain of art-galleries and museums. And, here too, ‘surveillance’ as both an aesthetic and a rhetorical address has been much explored lately. Not that this is news to anyone familiar with the growing corpus of artists choosing to explore multiple-screen installation and projection formats, but it’s the work of one young British artist that I’d like to focus on as regards the ‘new margin‘ that the aesthetics of surveillance might be seen to provide. Since the mid-1990s Dryden Goodwin has produced a body of video-works in single-screen and multiple-screen installation formats that are fascinating for their fully achieved exploration of a single idea. 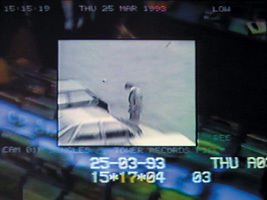 That idea might be found in Chris Marker’s observation in Sans soleil: “Have you ever heard anything more stupid than what they teach in film schools – not to look at the camera?” Goodwin’s work, particularly Hold (1996), Within (1998), Wait (2000) and Closer (2001), combines surveillance with intimacy. The artist is the surveillant, the one who gathers his material ‘on the run’, filming people who are unaware of his camera and he waits for privileged moments to reveal themselves: the camera’s gaze returned in Within, the expression of joy or sadness at the arrival or departure of a friend or loved one in Wait. These privileged moments are then extruded from Goodwin’s video footage by the use of highly sophisticated non-linear editing software which allows the artist to ‘dilate’ the time around them. And while it’s correct to observe, as the curator Sophie Howarth has done, that “his longing to watch and touch the people he films is characterised by a spirit of tenderness rather than surveillance” (14), it is the conjunction between the two states – surveillance/intimacy, looking/touching, visibility (of the one watched)/invisibility (of the one watching) – that makes Goodwin’s work so satisfying. In his most recent work Closer, exhibited in both three-screen installation (2002) and single-screen formats (2001), Goodwin extends the ‘look’ into a ‘touch’. For this work, Goodwin used a simple digital-video camera to observe the play of a laser-beam that he unobtrusively manipulated over buildings, urban surfaces, people and faces. The work presents a strange and compelling tension between distance and intimacy and provokes in the viewer both a fear of discovery (on behalf of the laser-bearing watcher) and a fear for those being watched and touched by the artist’s light. It’s a simple idea, but one so expertly organised and executed that the discomforting subtext remains hidden; this is the “tenderness” of a stalker, a version of ‘affective vidéosurveillance‘ that’s entirely unexpected. Closer is also a ‘city-poem’ of the very old-fashioned kind – a la Vertov and Ruttman – but also of the absolutely contemporary kind, too. It is a poem for the city of mechanical eyes in which the gaze becomes a strange caress emanating from an invisible source. To sign off, I’d like to offer some observations about a film in which there is not a single frame of CCTV footage and yet which seems to me to be a profound – and profoundly enigmatic – portrait of a woman ‘under observation’. Morvern Callar is the second, much anticipated, feature film by the young Scottish director Lynne Ramsay. Based on the novel by Alan Warner, Morvern Callar tells the story of a young female Scottish supermarket worker (a luminously vacant Samantha Morton plays Morvern in Ramsay’s film) whose boyfriend commits suicide and leaves her the manuscript of an unpublished novel. Near the beginning of the film, on the screen of the boyfriend’s computer (he’s already dead and Morvern steps carefully, tenderly over his bleeding body), we read one declaration – I Love You – and two injunctions – Read Me and Be Brave. The first of these injunctions – Read Me – doesn’t only instruct Morvern to read the manuscript of the novel but also instructs the audience to attempt to ‘read’ the mysterious character of Morvern herself. But, as a friend astutely pointed out to me, it also brings to mind the instruction that Lewis Carroll’s Alice saw on the bottle of magic potion – Drink Me – from which she sipped in Through The Looking-Glass. We too are present at the onset of a similar transformation. Be Brave? It’s a classically Existentialist injunction to Morvern (as well as being a further nudge to the audience in their viewing and a declaration of intent from the director to herself) to do what she desires, to go all the way, in the knowledge that she is “loved” from beyond the grave. Ramsay makes sure we notice the significance of these words – they almost have the status of intertitles in what is, at least in terms of the lack of emphasis on dialogue, a quasi-‘silent film’ – by according each phrase a full-screen close-up. And Morvern does just as she’s instructed. Substituting her own name for her boyfriend’s she becomes the ‘author’ of his text and mails off the manuscript to a publisher. So she steps through the looking glass into … an Antonioni film. There’s more than a few features to Morvern Callar that recall Antonioni, that almost make the film The Passenger for the Prozac Generation: the identity-swap, the flight to Southern Spain (in which Morvern is ‘re-born’ in the rave clubs of the Mediterranean coast). And then there’s the sense that Ramsay is experimenting with an Antonionian camera-poetic in which the camera’s point-of-view lends itself to being interpreted as the perspective of a ‘missing person’. Like The Passenger and L’avventura before it, Morvern Callar is the chronicle of a disappearance – Morvern from her life as a supermarket worker into one of hedonism and ambiguous freedom. But, in the process, Morvern becomes as ghostly as her dead boyfriend. But she’s our ghost, the spectator’s own projection, and Samantha Morton – with her extraordinary satellite-dish blankness – receives and projects back what the audience requires of her. This facility is what endows Morton with such a powerfully enigmatic screen presence, akin to that of the great actresses of silent cinema. It’s little wonder that Spielberg, in an inspired piece of casting, had her play a Delphic mute in Minority Report. The strange fascination with ‘vanishing’, with a ‘fading’ of identity, with ‘missing persons’ and ‘ghostliness’ that Ramsay finds and films in Warner’s novel creates in Morvern a kind of anti-heroine for the surveillance age. It’s interesting to hear that Ramsay’s next project will be a screen version of Alice Sebold’s novel The Lovely Bones, whose narrator is a dead girl (!) In Morvern Callar Ramsay emphasises this ‘fading’ of identity through her use of sound and music. The film’s musical soundtrack is just that, a literal soundtrack supplied in the shape of a cassette of music left to Morvern as a gift by her dead boyfriend. And when Morvern listens to this music Ramsay either cuts abruptly just before a melody starts to cystallise or a rhythm takes root or, very insistently, ‘fades’ the music from being the major element of the soundtrack to being experienced as a kind of ambience emanating from the headphones of Morvern’s walkman. Is this the director’s wink in the direction of a similar treatment of sound (and theme) in Agnès Varda’s Sans toit ni loi? Consider how Mona listens to a tape of (what else?) The Changeling by The Doors. It makes sense. There’s little doubt that Ramsay is a filmmaker who would not only know these works (Varda, Antonioni) but would also – and this is a mark of her talent – be able to allude to them in ways that enrich the texture of her stories and themes. Ghosts. Missing Persons. Invisibility. A strange and compelling fact – of the sociological variety – came to my mind while watching Morvern becoming ghost-like in the dance-clubs of Southern Spain. The 2001 Census in the UK uncovered the remarkable new phenomenon of nearly a million people going ‘missing’ from the population, “largely due to the untracked movements of men in their 20s and 30s heading abroad for work or extended raves in the Mediterranean sun.” (15) Morvern – who is at least in part under an assumed (male) identity – is one of these ‘missing people’ who, supposedly ever more visible ‘under the watchful eyes’, have vanished from the UK population. Clearly, it’s a fairly large marge inédite that is opening up within the UK’s culture of surveillance. And since I first saw Morvern Caller it’s been that existential injunction, delivered from one ghost to a ghost-to-be, that has haunted me: Be Brave. Acknowledgements: Gareth Evans, Kieron Corless, Yann Perreau, Libby Saxton, Steven Bode at Film and Video Umbrella, Rudolf Frieling at ZKM. Sinclair’s novels include White Chappell, Scarlet Tracings , Downriver , Radon Daughters  and Landor’s Tower . Petit’s films include Radio On , An Unsuitable Job for a Woman , Flight to Berlin , Chinese Boxes . He has made four films for British television with Sinclair: The Cardinal and the Corpse , The Falconer , Asylum  and London Orbital , as well as several alone including: Surveillance  Radio On Remix  and Negative Space . Chris Darke is a regular contributor to Sight and Sound, Film Comment, mute, and The Independent, a screenwriter and cinema programmer. His most recent book is Light Readings ? Film Criticism and Screen Arts (London: Wallflower, 2000).